Looking for babysitting at night partime/fulltime position and pick up occasional. As well as elderly job. Loving and Experienced Nanny Available Until September Due Date! Looking for a great family to help take care of for the rest of the summer! 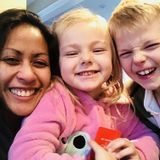 Nanny looking for a part-time permament position with 11 years childcare and housekeeping experienced. Nanny with over 10 of ficient in with communicating with children at different developmental stages.